It is important when installing any lighting products that the IP rating is suitable for the application. In a nutshell, ingress protection (IP) is an international standard for classifying the degree of protection provided against intrusion (body parts such as hands and fingers), dust, accidental contact, and water. LED tapes, being one of the most popular LED lighting products on the market, are generally available in four IP ratings explained below. Ensuring that you use the correct level of protection will minimize safety issues and premature failure of the luminaires. For example, installing an IP20 LED tape in an external environment will result in the product failing in a very short time as the copper of the FPC, the resistors, and the LED chips are fully exposed to the elements. The same applies to any other electrical products such as LED drivers, controllers, receivers, decoders, etc. Any electronics that are not IP rated for external use must be situated inside a suitable IP-rated enclosure to provide adequate protection. What do the IP ratings mean? P1 – IP20 rated products are for internal use only. They have no protection against dust, moisture, or water. P3 – IP65 rated products are suitable for internal or external installation. The luminaire is protected against dust, rain, and low-pressure water jets. IP65 LED tape is coated in a silicone gel. P4 – IP67 rated products are the same as IP65 but are also suitable for temporary immersion in water. 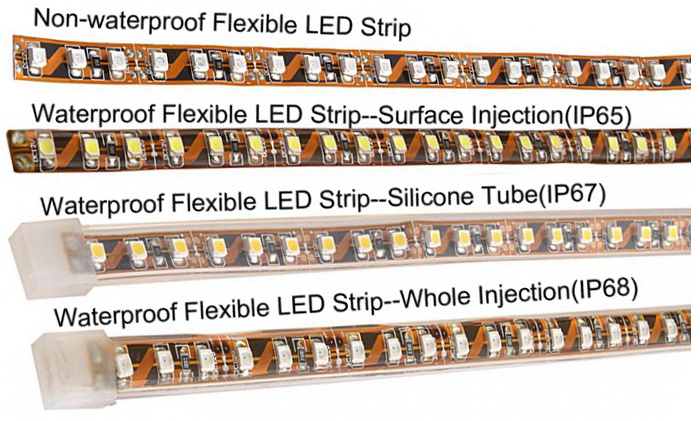 IP67 LED tapes are enclosed in a silicone tube. P5 – IP68 rated products are the same as IP67 but are suitable for permanent immersion in water to a depth of 1m. 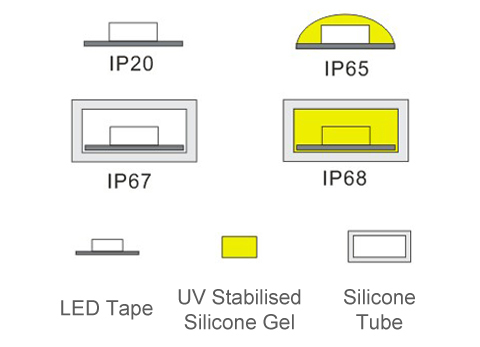 IP68 LED tapes use the same silicone tube as the IP67 tape, but it is injection filled with silicone. P5B – P5B LED tape offers the same IP68 protection as P5, but differs by using a brand new encapsulation method. Instead of having an injection filled silicone tube, the P5B version has the silicone material extruded over the tape itself in a single solid piece. This makes the product more durable.